I grew up in Florida and now I live in South Carolina… I have to be near a beach! Every year we take a beach trip and after only a couple of trips I realized that I had sea shells coming out of my ears. You can only comb the beach for sea shells so many times before you realize that you don’t know what to do with them all. So, I searched high and low on Pinterest for some ideas because I know I can’t be the only one running into this problem. Here are some of the favorite ideas I found. This letter would be so easy to make! 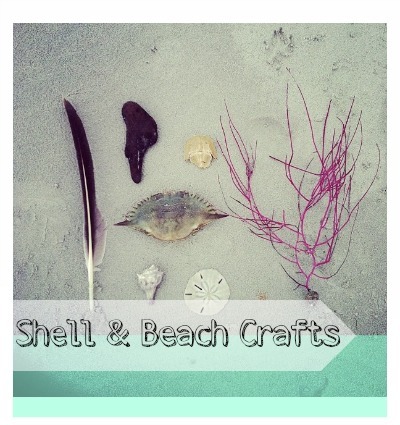 Get a letter from your local craft store, collect all of your shells (you’ll want lots of small shells) and hot glue them on. You’ll need the small shells to fill in the spaces between the big shells. You can always break some of the shells to make them fit. Tie a pretty ribbon around it and hang it on your front door or somewhere in your home. The letter above is from Etsy, so if you’re not up for actually making the letter, you can always buy it. 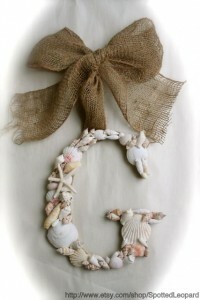 Here’s another craft that doesn’t take much time, but it looks great hanging on the wall… frame your shells! 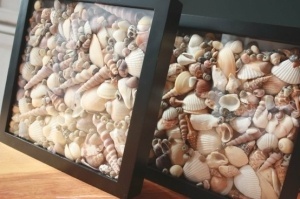 Get a shadow box from the craft store and just fill it up with all of your shells. I don’t think there’s a real science to it, if you don’t like the arrangement that turns out, you can always just pour it out and fill the box back up. Fill up a lot of shadow boxes even if they’re small and hang them together to make a gallery wall for a bigger impact. If you’re more of a neat and tidy art person, hot glue just a few shells onto a pretty background in the shadow box to make a collection of shells. 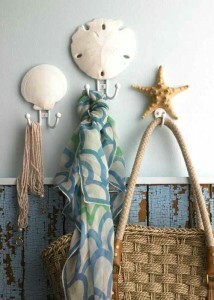 I love this idea from We Heart It to make either coat hooks or jewelry hooks using your sea shells. All you have to do for this one is hot glue your favorite shells on top of plain hooks and screw those hooks into the wall. It’s an awesome alternative to plain old hooks. I’d much rather see the pretty sea shells on the wall to hang our things on when we walk in the door! 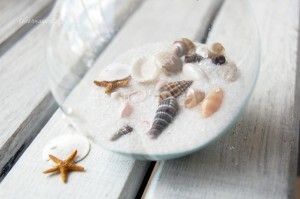 You can always get a head start on Christmas tree decorations with your beach collection. Either thread a string directly through the shell, star fish, or sand dollar (just drill a hole if there’s not one already) or create a globe ornament with your tiny shells. Simply fill a clear ornament with either sand or glitter, insert your tiny sea shells, put the cap back on the ornament and tie a string for it to go on the tree! The possibilities are endless with your beach finds. You don’t have to just bring them home and put them in a glass jar when you have Pinterest to inspire so much more. For more ideas, follow the Southern Savers Beach Crafts Pinterest Board.